In local season opening news, PHAME’s got a new executive director, Action/Adventure Theater has closed its doors after an epic five-year run, and Readers Theatre Rep just raised their ticket price to a whole $10 (still worth every penny, I’m sure; they’ll read two Arthur Miller plays this weekend). In the news: Last Tuesday, Attorney General Jeff Sessions announced a repeal of DACA, the Deferred Action for Childhood Arrivals program that offers protected status to undocumented persons who’ve lived in the US since their childhood. Meanwhile, onstage: Last weekend, Ingenio Milagro, a Milagro Theatre’s playwright development symposium similar to Portland Center Stage’s JAW festival, presented four scripts including Monica Sanchez’s Los Dreamers, the story of “Dreamer” Scoobi. In the news: The Oregon Bach Festival is reeling over international backlash after firing their artistic director Matthew Halls in response to an incident one might call “Grit Gate.” The Telegraph reports that Halls was overheard joking with his friend, African-American singer Reginald Mobely, and had made a quip about grits while mimicking a southern accent. Though both Mobely and Halls maintain that the joke was about the South generally rather than a Black stereotype, a white woman who overheard the remark complained to University of Oregon leadership, who summarily relieved Halls of his post. With press outlets in Halls’ native England picking up the story, Grit-Gate seems to have grown into an international incident. Meanwhile, onstage: Hillsboro’s Bag&Baggage opened its season last weekend (in a new space) with Rebecca Gilman’s Spinning into Butter, a drama wherein an African American student at a primarily white college receives hate mail and the school’s administration struggles to react appropriately, arguably making things worse. In the news: Hillary Clinton has just released what is sure to be a polarizing book, What Happened, asking exactly that of her 2016 presidential campaign and taking belated jabs at her opponents left and right. Meanwhile, onstage: Hillary Clinton, of all people, will visit Portland on December 12. See Portland’5 for details. 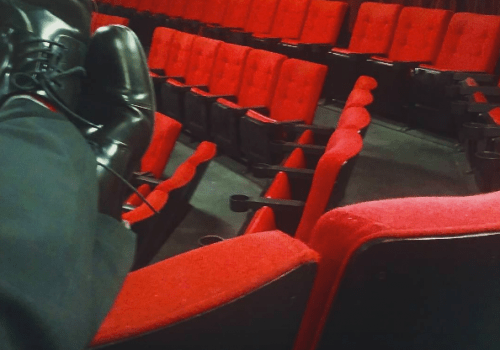 Mister Theater: feet off the furniture, kid. Back Fence PDX This storytelling showcase regularly presents a solid roster of raconteurs, and this installment includes “Portland’s Funniest Person 2017” Caitlyn Weierhauser, aptly-named web series star Ben Weber, sketch comedy specialist Andrew Harris, cultural competency consultant Bealleka, and retro glam cult novelist Jennifer Robin. Now onward to PICA TBA:17 (Portland Institute for Contemporary Art’s Time-Based Art Festival), whose program I’ve perused and—just as my ArtsWatch colleague Jamuna Chiarini did for dance—I’ve plucked all of the remaining theater works from the schedule and linked them here for your ease. Less easy for me, and I’ll tell you why: this calendar is chockfull of crossover acts, most especially performance artists who infuse their theatrical pieces with varying amounts of original music. Are such shows concerts, or are they theater? Yes. Will all performance artists be required to write their own music from now on? I hope so. Discuss. TBA performances this week include several appearances by Saudi artist Sarah Abuabdallah, three Sigourney Weaver Jam Sessions by Manuel Solano, an evening with singer/monologuist Joseph Keckler, the pop song/deadpan storytelling pairing of Half Straddle‘s Ghost Rings, Cvllejerx throwing a Super Tantrum, and the “psychoacoustic” thralls of Sound et Al. Whew! That’s all the drama I have for this week. Hand me my mister. With this column, the sharp-witted and sharp-eyed A.L. Adams begins her weekly look at what’s happening on Portland’s theater stages. Look for DramaWatch Weekly every Tuesday.